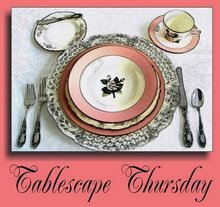 How fun to be joining Susan @ Between Naps On The Porch for Tablescape Thurs. Such a fun chance to play with my dishes. My Mother's Day flowers are still so pretty, they just keep opening more and more and getting prettier and prettier, so naturally this table is all about the flowers. I love the colors of the flowers and wanted the table to echo all the same colors. Since the flowers are yellows, golds, oranges and white, I chose two table runners with the same colors. I love the crewel design and colors in these runners and they seemed perfect for the flowers. Touches of orange to accent the flowers. I kept the garden theme going with the placesettings. White chargers, yellow dinner plates, white leaf salad plates and orange leaf bowls. Amber goblet and clear wine glasses. My ivory Horchow flatware and a checked napkin in colors to compliment the runners. A few tealights and a couple of orange candles. Thanks for letting me share my Mother's Day flowers. Runners and Napkins - Ones I made years ago. Oh Marty, what a beautiful table!! The flowers are gorgeous along with all the other beautiful dishes. Marty, I love this table setting. The oranges, yellows and whites are so pretty with that beautiful flower arrangement. Very pretty! I love your runners, and I really need to collect some amber pieces! They've been catching my eye. Hi Marty you always put together a beautiful table.I love your plates and silverware! Beautiful, Marty! I am taking advantage of the Mother's Day flowers too. It would be a shame to waste them right? Such pretty colors and layers in your table! What a gorgeous table! I love everything especially the flowers!! Marty, you did a very fine job. The flowers are lovely and I love those finely differentiated colors of the dishes. That looks so great with the tablerunner and mats. Really beautiful and very elegant. What gorgeous colors and that centerpiece you created is just the prettiest! 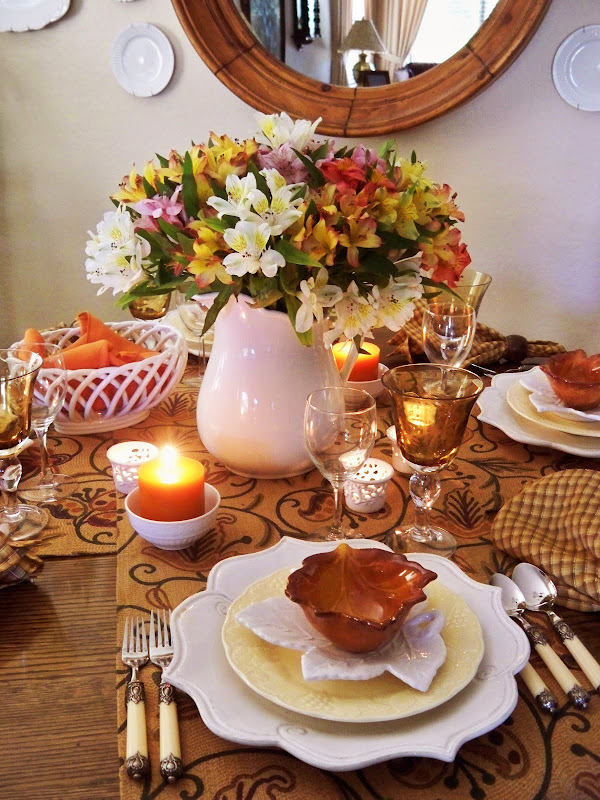 I love the table runner and the touches of orange. You always inspire! Hi Marty, Love the table setting and the pretty Mothers day flowers, such an inviting table you have made. I look forward to your blog and all the pretty pictures of your home. I love your beautiful flowers AND your tablescape. Everything is so pretty. I love how you used two different table runners, that is such a great idea. I especially love the table runner with the crewel design. I love all the layering of your pretty chargers, yellow plates, leaf plates and leaf bowls. 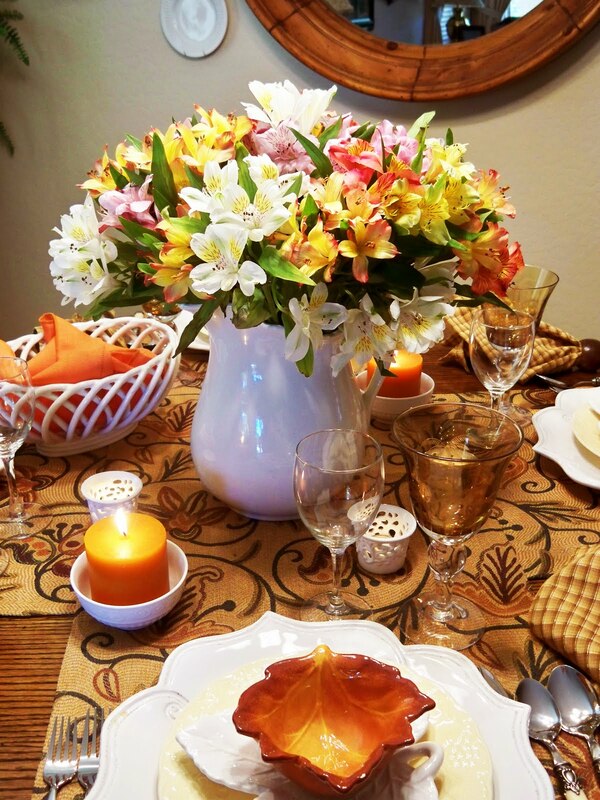 Thank you for sharing such a beautiful tablescape. Your flowers are stunning, Marty and hold the whole table together so nicely. I love all the pretty colors and the dishes in all their different shapes. This is one beautiful tablescape!! Your Mothers Day flowers are BEAUTIFUL! I just love the assorted colors. We both also used white pitchers in our posts this week. LOL Great minds alike again. I hope your Mothers Day was extra special. Lovely flowers, that you stated "echo" to your dishes. SO warm and exotic. Love them all. TY for sharing you talent. I do admire it. Thank YOU for sharing your Mother's Day flowers! I love those flowers, and they last quite a long time -- just beautiful. 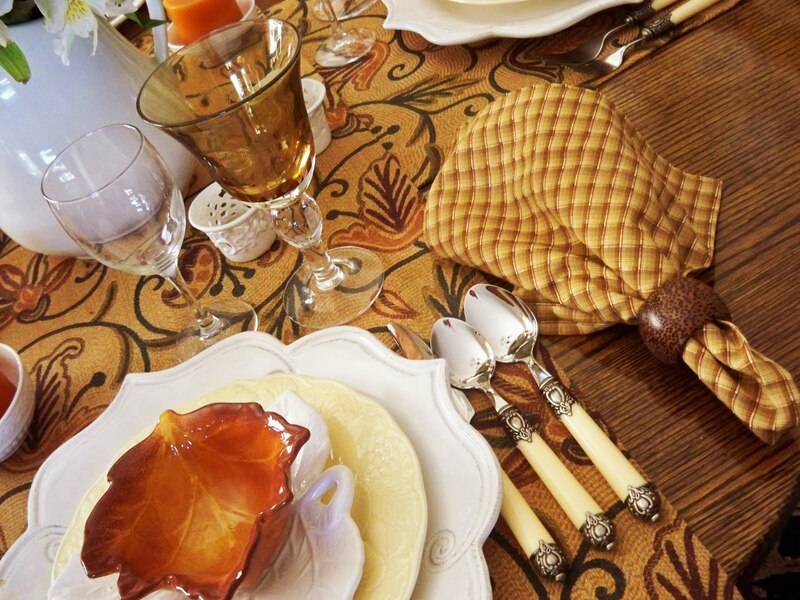 Everything about this table is wonderful -- love the colors, love the dishes, ADORE the amber goblets. So very pretty! You have SUCH a good eye for bringing together different elements and creating something so very beautiful. Thanks for sharing! Your table top is very pretty and your gorgeous bouquet reminds me I want to plant another color of Peruvian lily, maybe yellow. Marty, your table is gorgeous and the flowers just set it off. Your table is gorgeous! the flowers are beautiful and those runners, love them. I also am in love with the flatware and those white charger plates!! Such a pretty and inviting table! beautiful. Love those flowers and your amazing dishes.. I love the warm colors paired with the bright flowers; it reminds me of a warm summer's day! Beautiful dishes too; I especially love the leaf salad plates. Oh how pretty your Mother's Day bouquet is! I love those particular flowers because they last so long! 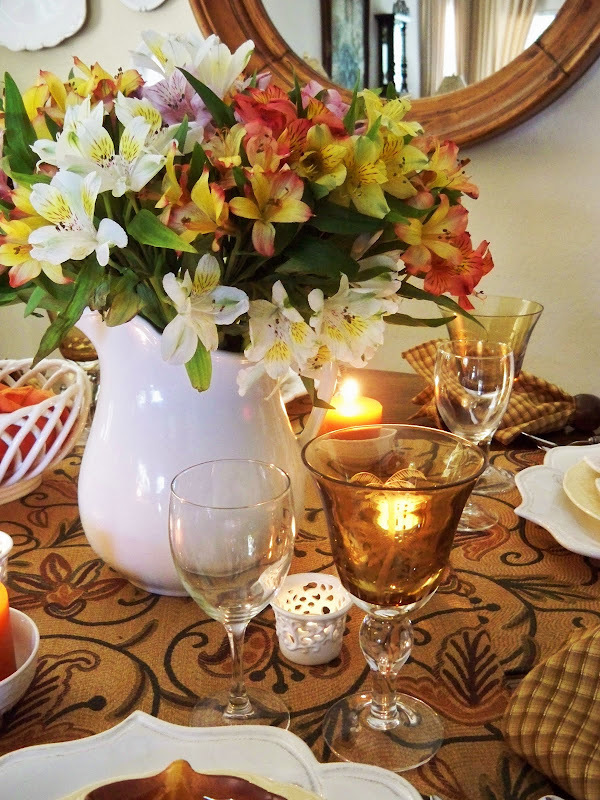 Your table compliments them so well with your warm pretty colors. I really like how you have used "leaf" dishes and rich orange colours in this 'scape! Usually, you think of those as fall accessories but you have inspired me to get some of mine out and use them for summer. Your flowers are gorgeous and make the perfect centerpiece in that pitcher! This is so pretty Marti! I love the flowers and your color choices really make them the "centerpiece"
Marti, you did an outstanding job with your tablescape. Your flowers, oh, your flowers! So pretty! 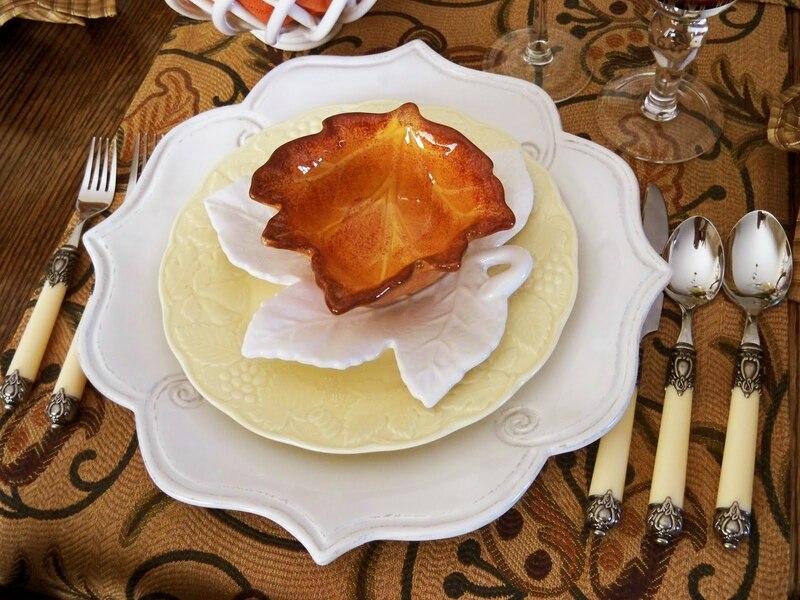 They are a perfect centerpiece that sets off everything from your linens to your china! I love your leaf dishes, too. They are so cute, and everything just flows together so well like a perfect symphony. Very pretty table. I love the amber colors with your flowers. This is so beautiful!! I love it! The beautiful peruvian lilies were a fabulous inspiration which you complimented perfectly in your choice of dishes,stem and flatware. I love the amber goblets and leaf plate. The whole setting is breathtaking. Thank you for sharing this wonderful table and a belated Mothers day to you. Hi Marty, I just wanted to stop back by and Thank you for visiting and leaving your kind comment on my My "TWEET" Tablescape Thursday", it was so much fun designing this table. I'm really enjoying birds this year! Your beautiful Mothers Day flowers are gorgeous and I love the way you have put your tablescape together to enhance them. The table runners are wonderful, so rich and elegant. I just found your blog. I love it! I love the leaf bowls. They are so cute! Beautiful flowers and also a beautiful table. I love your selection of plates to layer. Everything is so warm and welcoming!! I'm crazy about those runners. They look so pretty with the flowers but I could see them working well at a Thanksgiving dinner too with rusts and gold flowers. Marty it is gorgeous! I have never seen such pretty and vibrant flowers. You did a wonderful job. 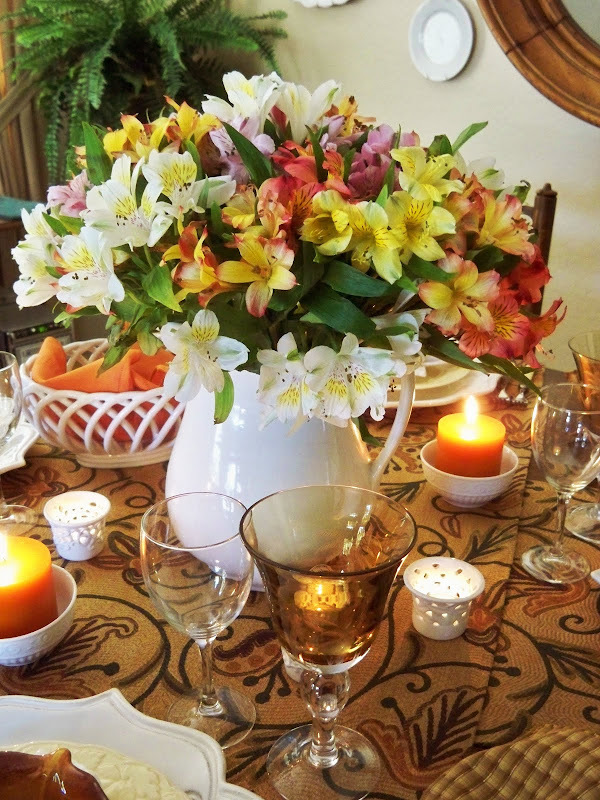 Beautiful flowers to grace your lovely table! Beautiful table and I love the complimenting colours. Your cutlery is very pretty too, with the bone handles. Just lovely. I love the pitcher/vase you have your flowers in....I am love the beautiful white contrast with the flowers. I think I will steal your utensils, however!! What lovely flowers! I am so glad they are still blooming for you! You did a great job of complimenting the table setting with the flowers. I love your white on white. The leaf bowl is the perfect color touch! Hugs!! What a beautifully set table! It is gorgeous. Beautiful table, Marty. 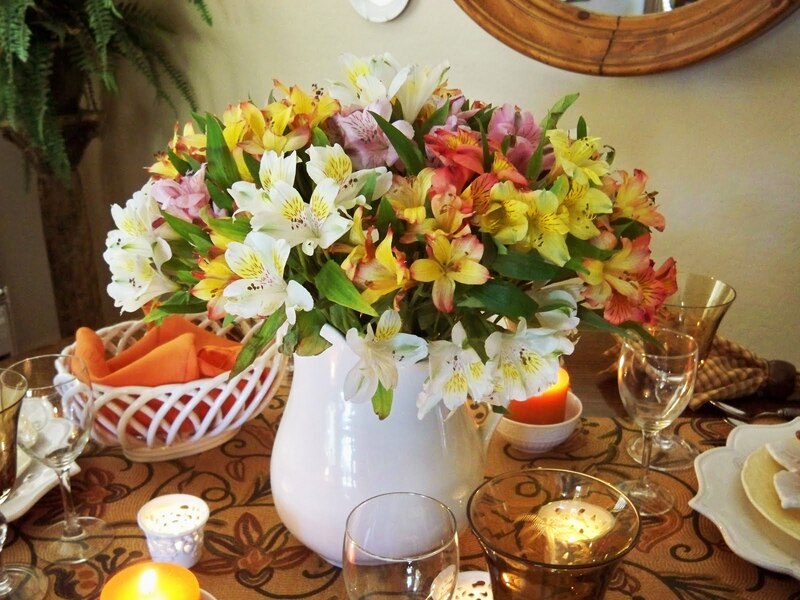 The alstroemeria are stunning! You're right...those flowers are amazing! And youv'e set the perfect table with a wonderful golden background!!!! Great contrast!!! Marty, absolutely gorgeous! Oh well done! Marty, I was all set to say how smart you were to think of buying TWO runners to overlap that way, and then I saw you'd MADE them! I am going to make some for myself -- I've only made one for my mother's table till now. 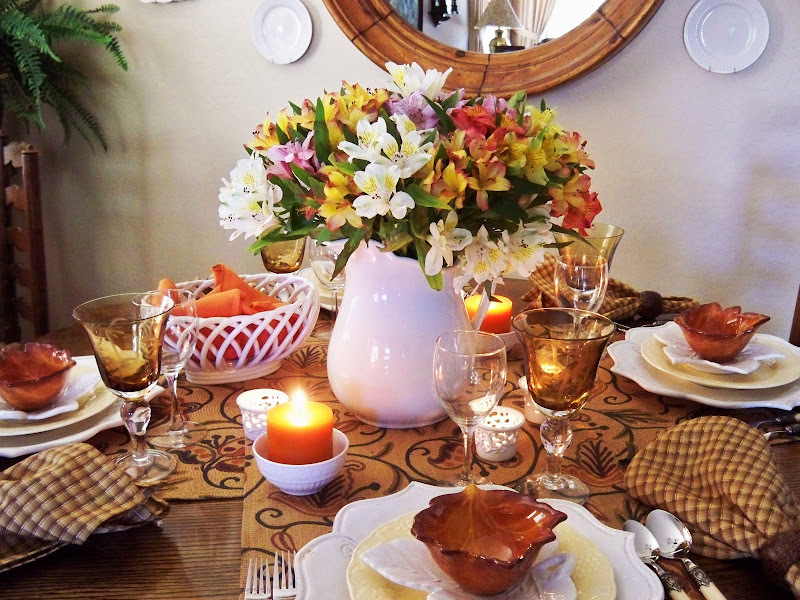 Your table is so beautifully put together -- all the whites and creams with pops of orange really make your pretty Mother's Day flowers the star! This is such a warm inviting table. I love the colors! Very pretty! Love your table and the shapes of each of every plate are gorgeous. Marty! YOu really outdid yourself this week! This is THE prettiest table setting I believe you have ever done! I LOVE your table runners. I LOVE your white plates which contrast so well, and really POP! And just yesterday I was at a friend's house and she had a bread basket like yours and I coveted it, and now today here it is again! I NEED One! lol! p.s. You are a dear! I think I have yet to set a beautiful table! Yours is gorgeous with the layers of plates picking up on the colors of the flowers...I wouldn't want to mess it up with food!! the tablescape is done so beautifully and is very inviting!! i love all the dishes, especially the chargers and don't forget the flatware!!! Marty, Your alstromerias are fabulous! So colorful and glad they are long-lasting! Love your dishes, especially the leaf shape. Pretty stemware too, great table! 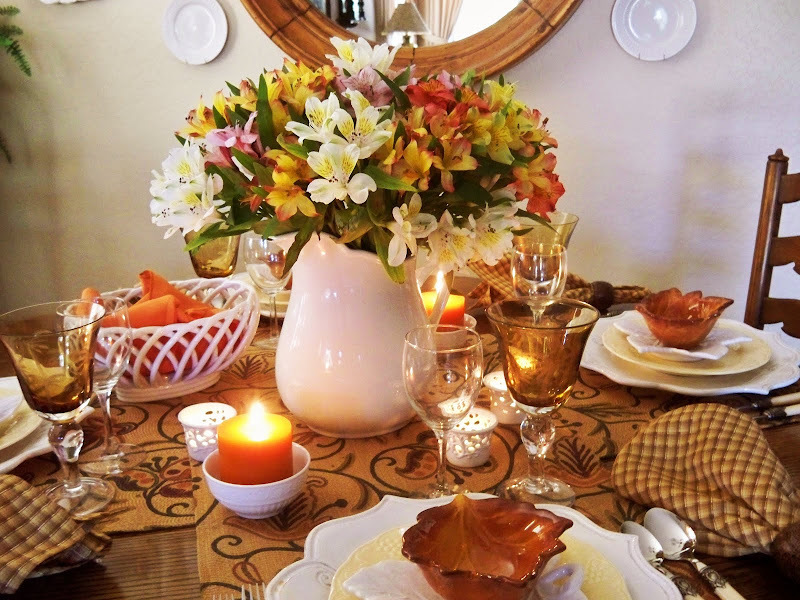 First time visiting - love your blog - love your tablescape - very pretty!